This is another drink from Ted Haigh’s Vintage Spirits & Forgotten Cocktails. While there isn’t a lot of info in this book, Our Libatious Nature suggests that it originated in 1922 at the Embassy Club in London. I also agree with them that though Mr. Haigh suggests that the name is meant to evoke a tropical feel, there’s nothing tropical about this drink. The nose is redolent of the distinctive notes of Clear Creek’s apple brandy, along with the dry fruitiness of grapefruit, and hooks up with the honey to bring out a slight floral aspect. The sip opens with very mild sweetness, as the apple brandy, grapefruit, and honey jostle for space. 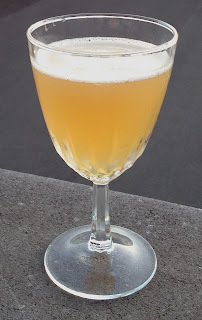 Then it fades into drier flavors from the grapefruit and Swedish punch, which becomes slightly bitter, astringent, and distinctly dry on the finish. Overall this is a rather interesting drink. As written in VSFC, it was a little bit too dry for my taste, but the addition of a bit of honey really helped to balance it out and, I think, enhanced the drink significantly. And even with that modification, it’s not going to tickle your sweet tooth too much – the other ingredients keep it rather snappy. Combine all ingredients, shake with ice for 6 seconds, then strain into a chilled cocktail glass.